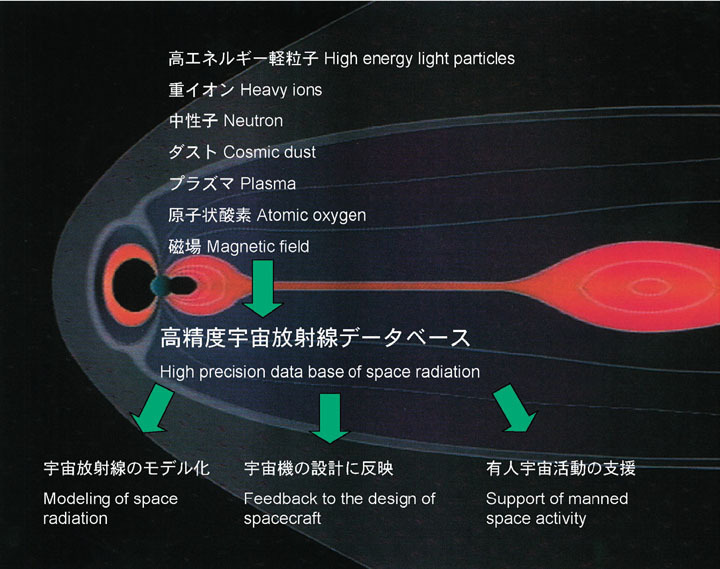 SEDA-AP was measure space environment (neutrons, plasma, heavy ions, high-energy light particles, atomic oxygen, and cosmic dust) in ISS orbit and environmental effects on materials and electronic devices to investigate the interaction with and from the space environment at the Kibo exposed facility. At the same time, it is also expected to conduct on-orbit verification of APBUS (Attached Payload BUS) technology, which furnishes necessary functions when mounted on the Kibo exposed facility. In future space activities, it is very important that space environmental data about space radiation degradation of space parts & materials and space craft anomalies are acquired for space craft design and manned space activity. 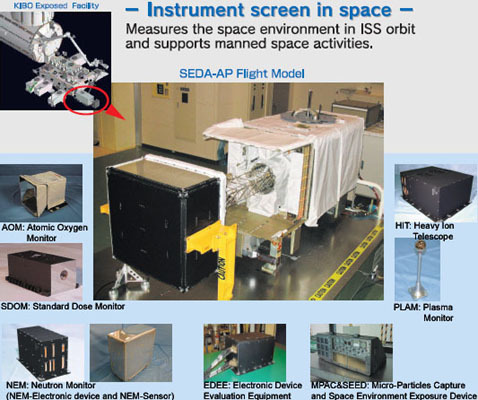 Various space environmental data acquired by SEDA-AP will be utilized as fundamental data for space equipment design. In addition, it is also expected to be used for related scientific research, ISS operation, and space weather forecasting. (1) Development of various space environmental data base for many utilization needs. Making and maintenance of space environmental model for space craft design. 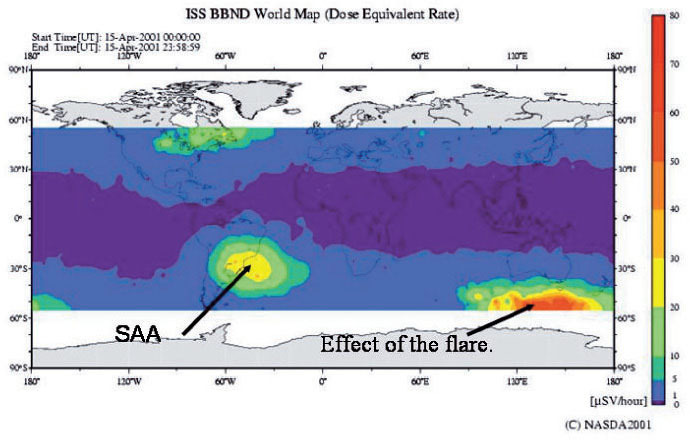 Support for astronauts exposed to space radiation. Support for space weather forecasting. 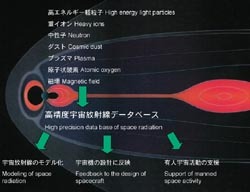 Investigation of space radiation degradation of parts & materials and space craft anomalies caused by space environment. (2) On-orbit verification of the KIBO exposed facility utilization technology. On-orbit verification of APBUS technology that utilizes the KIBO exposed facility. 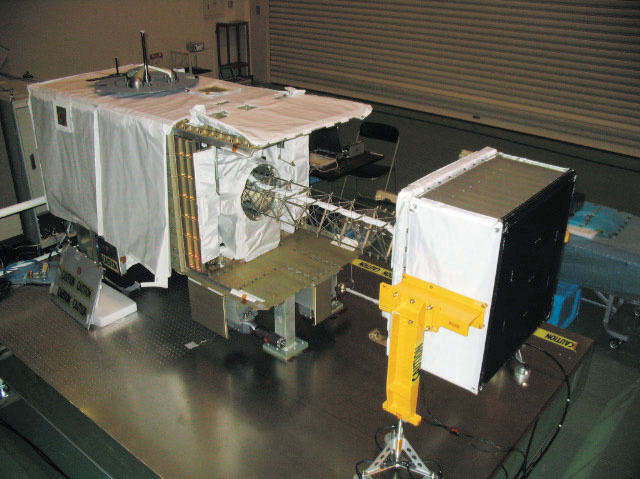 On-orbit verification of experimental payload integration technology that utilizes the KIBO exposed facility. SEDA-AP is equipped with APBUS (APBUS is a generic term of each component or subsystem) that enables various interfaces with the Kibo exposed facility and is also expected to conduct on-orbit verification of APBUS technology. SEDA-AP was launched on Space Shuttle STS-127 (2J/A) and installed on the Kibo exposed facility. 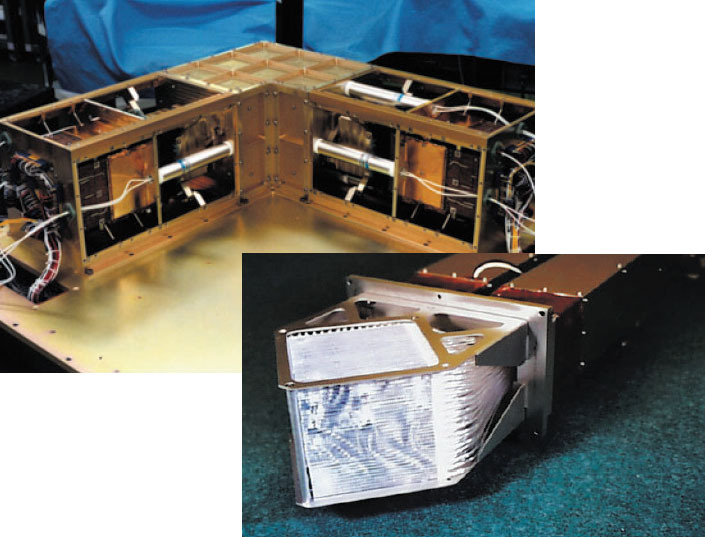 After the extendable mast deployed each sensor or measurement instrument began experiments. 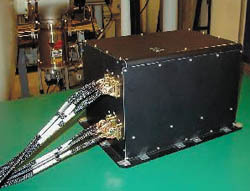 Extendable mast, on which NEM sensor and PLAM sensor are mounted, extends over 1m from main structual body of SEDA-AP. 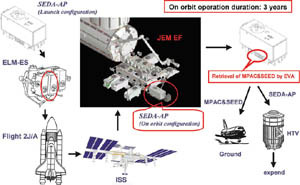 The on-orbit experiment (observation and data acquisition) by each sensor or measurement instrument will be conducted simultaneously and continuously for approximately 3 years (Original plan). 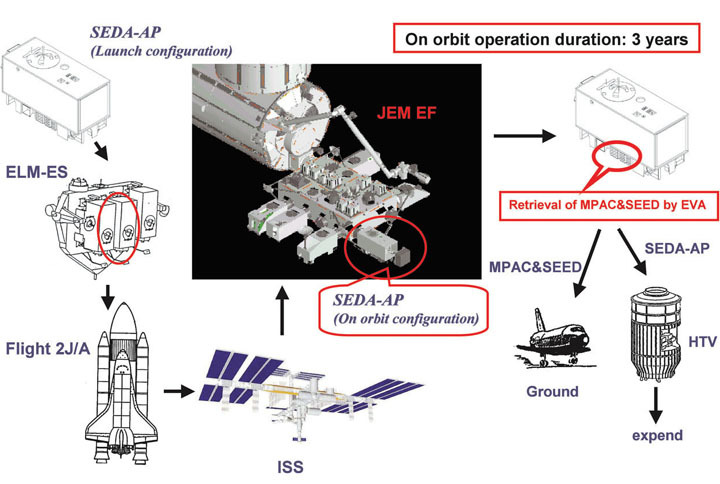 After nearly 3 years of observation experiments, sample part of MPAC&SEED mounted on SEDA-AP's surface will be retrieved by EVA crew and be returned to the ground by Space Shuttle (Original plan). Neutron is very harmful radiation because of its strong permeability due to its electrical neutrality. The Neutron Monitor measures thermal neutron to 100MeV neutron by Bonner Ball Neutron Detector (15MeV or less) and Scintillation Fiber Detector (15MeV to 100MeV) in realtime. Output wave height distribution by neutron is different from that by other radiation rays such as proton and photon etc. 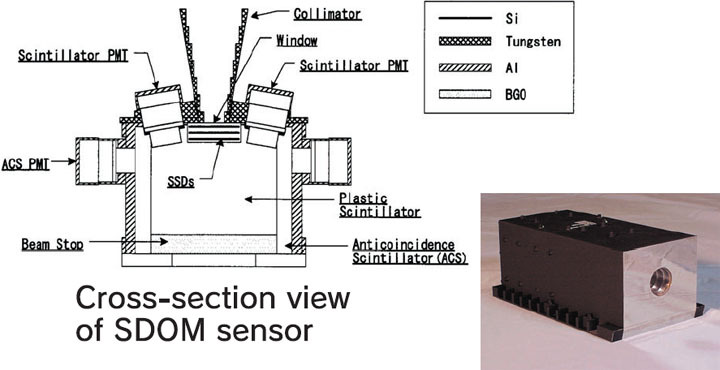 Scintillation Fiber Detector is assembled by mutually-perpendicular scintillation sticks (16x16). It measures tracks of recoil proton from each lot by multi anode photomal and estimates energy and incident direction of neutron by its amount of light emission and tracks. The Heavy Ion Telescope (HIT) measures energy distribution of heavy ions (Li - Fe), which cause single event anomaly and damage of electronic device, by Solid State Detector. Incident charged particles coming into 2 PSDs and 16 SSDs produce pulses with electric potential that is in proportion to the dissipative energy of incident particles. HIT utilizes this principle. It measures dissipative energy (delta E) in each detector and also measures the total energy (E) for the particles that stopped in the detectors. 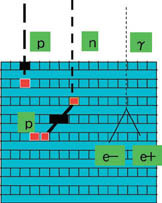 It discriminates particles from obtained energy and dissipative energy in each detector by delta ExE method. 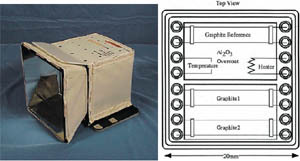 The Plasma Monitor (PLAM) measures the density and electron temperature of space plasma, which cause charge and discharge of spacecraft, by Langmuir probe. 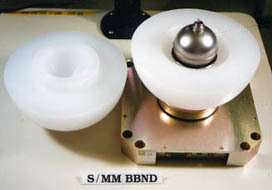 Metal sphere is used as a probe of PLAM sensor. 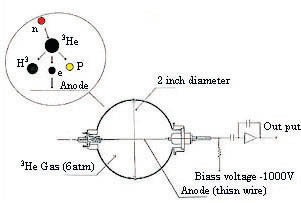 It measures the density and temperature of electron by analyzing current-voltage characteristic obtained after applying variable voltage to the probe and it also measures plasma potential by floating probe. 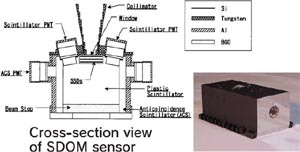 The Standard Dose Monitor (SDOM) measures energy distribution of high energy light particles such as electrons, protons, and alpha ray etc., which cause single event anomaly and damage of electronic device, by 3 Solid State Detector and scintillator. Energy of incident particles will be measured by 3 SSDs and in case that the energy penetrates those SSDs, that energy will be measured by scintillator behind the SSDs. Discriminating particles is to be achieved by delta ExE method using combination of wave height from each detector. 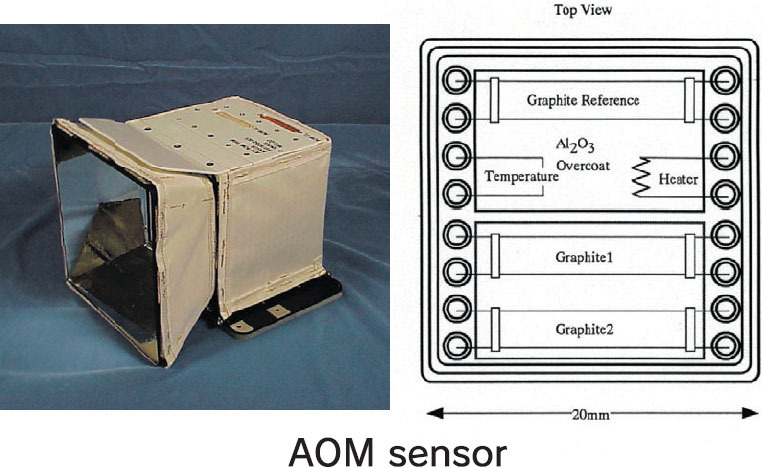 The Atomic Oxygen Monitor measures the amount of atomic oxygen in ISS orbit. Since atomic oxygen is very active, it interacts with the thermal control materials and the paints, and then makes their thermal control ability worse. The thickness of thin carbon film will be decreased due to erosion by atomic oxygen. The change in the thickness is calculated as resistance value. Integration flux of atomic oxygen is to be measured by preparing the table showing the relation between the change in resistance value and integration flux of atomic oxygen in advance. 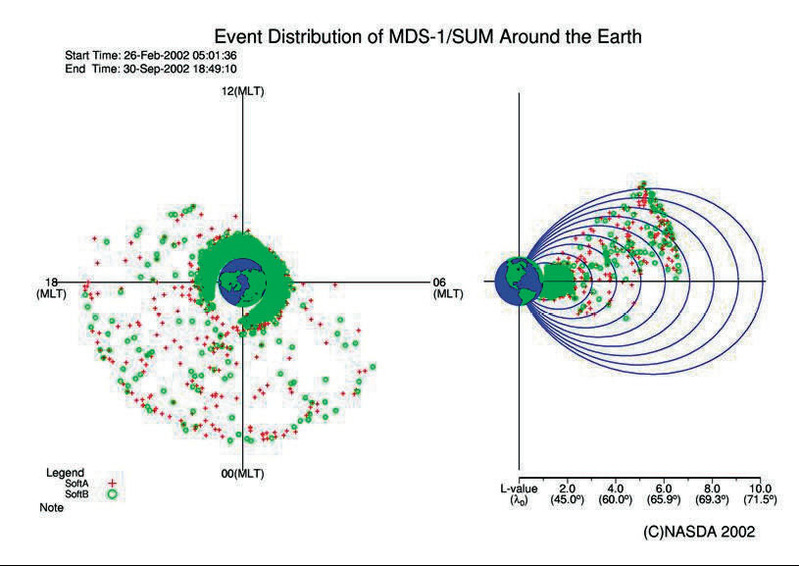 EDEE collects the data of electronic parts about Single Event Effects (SEEs) caused by radiation in the space. V70-MPU, 1M SRAM and Power MOSFET are selected because those have sensitivity for SEEs, and are important for the JEM system. For V70-MPU and 1M SRAM, Single Event Upset (SEU) and Single Event Latchup (SEL) are expected to happen. Power MOSFET is for SEB (Single Event Burnout). SEE is induced by the radiation entering the electronic parts. EDEE detects SEU,SEL and SEB by monitoring the storage data inversion, the power supply current, and the electric charge, respectively. The results can contribute to improve the accuracy of the prediction how a part will behave in the space by the ground radiation test. Furthermore, the data will be used in order to find the causes if the problem were detected on JEM system. The Micro-Particles Capture (MPAC) is a device for capturing micro-particles (space debris and micrometeoroids) that exist at the ISS orbit. Post-retrieval analysis will enable particle size, composition, collision velocity, etc., of captured particles to be estimated. MPAC consists of two materials; silica aerogel and a golden plate. The former will allow us to determine particle impact directions and velocities from tracks left in the material. Chemical analysis of impactor residues will then yield particle composition. The golden plate will provide a means for measuring particle fluxes, and estimating impact velocities by analyzing craters in the material. 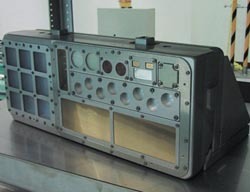 The Space Environment Exposure Device (SEED) exposes materials for space use (thermal control materials, solid lubricants, etc.) to the space environment. After retrieval, we will analyze the degradation of these materials due to the space environment - namely radiation, ultraviolet rays, and atomic oxygen - as well as examine changes unique to each material. 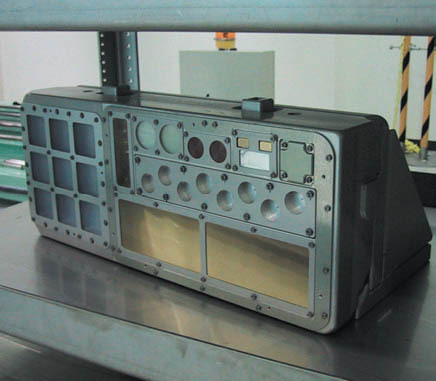 SEDA-AP's MPAC&SEED sample was returned to Earth on STS-131.